Well-versed in traditional spine surgeries, Dr. DenHaese also specializes in minimally invasive spinal technology which allows for: a shorter recovery time, smaller incisions, less hospitalization and minimal tissue destruction. Spinal cord monitoring is often integrated into his surgeries, which provides additional protection to his patients. His goal is always for avoidance of surgery and conservative care where applicable. However, when patients require surgical intervention for spinal reconstruction or decompression his emphasis is on minimally invasive spinal surgery and motion preservation. 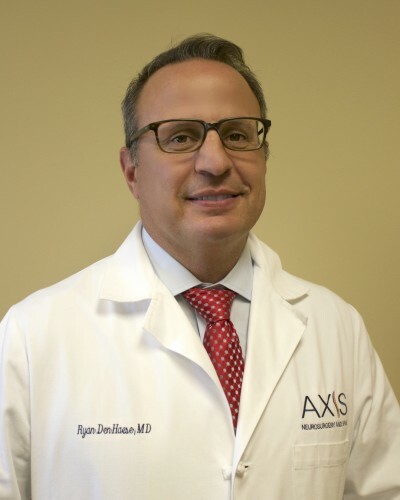 Dr. DenHaese has extensive experience in degenerative spinal conditions, artificial disc replacement, spinal reconstruction, scoliosis, neuro-oncology, and trauma. Dr. DenHaese has trained more than 1000 surgeons worldwide in Asia, Europe, South America, Mexico, and United States. He gives presentations concerning Minimally Invasive spinal surgery throughout the world annually and is considered a surgeon leader in Minimally Invasive spinal surgery. He has been and is medical director and director of medical education for numerous spine companies; Lanx, Zimmer, Biomet and Corelink. In his spare time Dr. DenHaese enjoys time with wife, Diane, and their four children. Once a Junior Olympian and Division I soccer player, Dr. DenHaese now spends time traveling, reading, golfing and playing soccer. He was recently named to the Board of Directors of his alma mater, Niagara University. See Dr. DenHaese's full bio here.